McGinely is hoping her recurring role on Outsiders will provide new opportunities for her acting career. You can also catch her in small roles in 478, produced by Arnold Schwarzenegger and filmed in Columbus, as well as the Cleveland-shot Dog Eat Dog, with Nicolas Cage and Willem Dafoe. “I love acting and could never imagine myself not doing it,” she says. Midwest Movie Maker took some time to talk to the young actress prior to the debut of Outsiders. Midwest Movie Maker (MMM): Tell us about Outsiders​. What’s the show about? 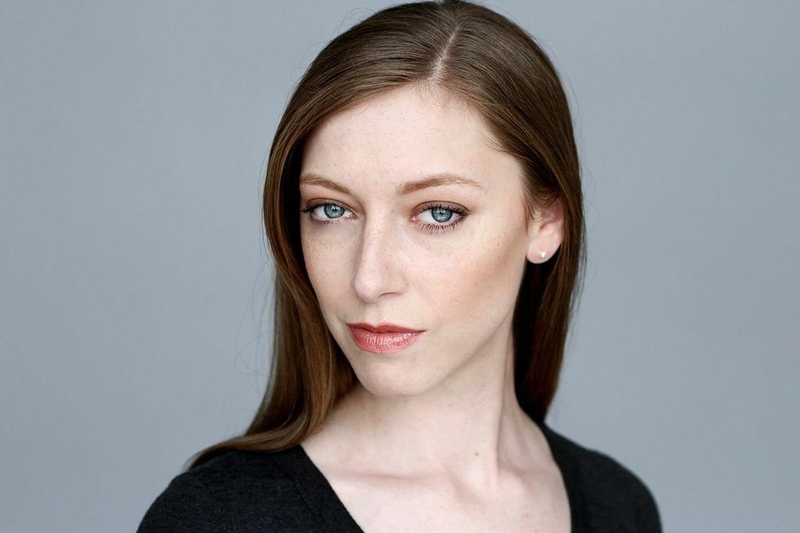 Johanna McGinely (JM): Outsiders is about the conflict between the Farrells and the people of Blackburg, Ky. The Farrells are a clan of family members who have lived off the grid on Shay Mountain for over 200 years. Blackburg is the small coal ­mining town below the mountain. This is the story of how the Farrells protect their mountain against the townies while defending their chosen way of life. MM: Tell us about Annalivia Farrell, the woman you play in the show. JM: Annalivia is the caretaker to Lady Ray Farrell, whom is our Bren’in. (Bren’in is a word we call our Leader.) Annalivia has taken a vow of silence for the servitude of her Bren’in. She is the only character on the show to do so. She is a peaceful, silent character always by her Bren’in’s side. The writers have not explored her backstory yet on screen. I have heard rumors of Annalivia that could be in the future of the show. But we will have to film the second season before you know the real secrets of Annalivia and her past. MM: How did you get involved in the show? JM: I submitted for a featured role I found on Facebook through the extras casting director, Chelsea Peterson. I’ve known her for a few years. She put me and three other ladies in for this ‘Annalivia’ role. I drove to Pittsburgh to stand in front of the director, writer, AD, and UPM. All four of us were lined up. 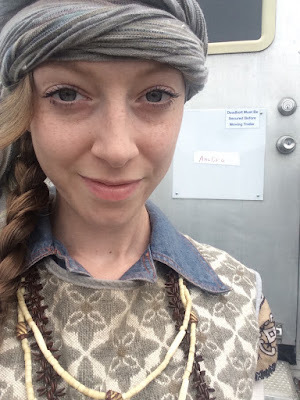 Thankfully, I knew the stunt coordinator and a gaffer who said “Hi,” and hugged me while passing the casting office. I was then asked if I knew how to do stunts. I replied explaining I’m training but have not been paid for stunts yet. Then they had us all say our name and that was that! Johanna McGinley, up front, with fellow actors - most series extras and fellow Midwest actors. MM: Was the series shot entirely in Pittsburgh? JM: Everything I filmed was in Pittsburgh. We shot at 31st St Studios in Pittsburgh and a few surrounding suburbs. There was probably pickups, stunts, and b-­roll done in Los Angeles. MM: How has the response been so far, before the show debuts? JM: There is so much hype for this show! I had no idea when I was cast that it would get this much promotion. WGN America is really trying to prove their solidarity in scripted TV. Outsiders sponsored UFC’s last big match. They’ve had commercials during the Democratic and Republican debates. They are also premiering commercial free! MM: What are you most excited for viewers to see? JM: I’m just excited to have this type of exposure. I want viewers to see me. I want them to think, “Who is that girl?”. MM: Do you think this signals more work for Midwest actors? Are more shows coming to the Midwest? JM: Sure. If Outsiders continues to film in Pittsburgh, every episode will need new characters and dayplayers, which will create more opportunity. Even featured characters in previous episodes could become more prominent. Also, if producers are happy with the show and it gets good ratings, there’s a possibility more TV shows will want to take advantage of the tax incentive, local actors, local crew, and locations in the Midwest. JM: I just hope everyone tunes in to Outsiders and continues to watch every Tuesday night at 9 on WGN America! You will be entertained, and you will be supporting local Midwest actors.